Siobhan Kukolic - Mother-of-three. Freelance writer. Believer in dreams. Mother-of-three. Author. Motivational speaker. Freelance writer. #HuffPost blogger. Believer in dreams. I can’t believe the day has finally come. I am a published author! I decided in the year 2000 to write a book and I made a goal of 100 rejection letters because Dr. Seuss got 43 for his first story. To date I am at 32 rejections for various manuscripts. Then on January 1, 2016 I started a weekly blog which led to my becoming a blog contributor for The Huffington Post. I decided to turn the first year of my blog into a book and here we are. The Treasure You Seek is about following your heart, believing in yourself beyond reason, embracing failure and knowing that you are enough. It includes inspirational stories about famous failures, cultural icons, world leaders and regular folks like you and me. The goal is to remind us that we have all we need to be the change we wish to see. 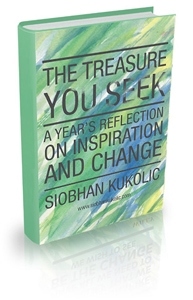 A perfect read for graduates from elementary school through university, people starting their career, changing jobs or retiring, friends going through a medical crisis, new parents, empty nesters and anyone who wants to be inspired.